Cranberry Pecan Green Bean Casserole is an easy holiday recipe. It’s a fun twist on classic green bean casserole and comes together in no time! Every holiday table needs a classic green bean casserole, right? It’s a must make for my family along with sweet potato casserole, and our favorite pumpkin pie recipe. This year, I’m hosting Thanksgiving, and I wanted to serve the classics, but with a twist. I love sticking to tradition, but adding something unexpected, fun, and flavorful. 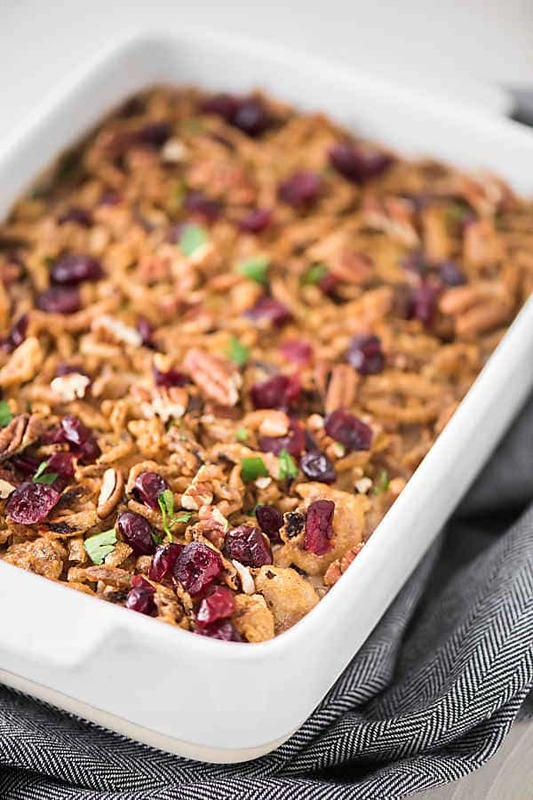 Since I’m a huge fan of pecans and cranberries, and snack on them all year long, I decided they would make a great addition to a classic recipe. They offer a match-made-in-heaven flavor combination, and pair well with a cherished holiday classic–green bean casserole! 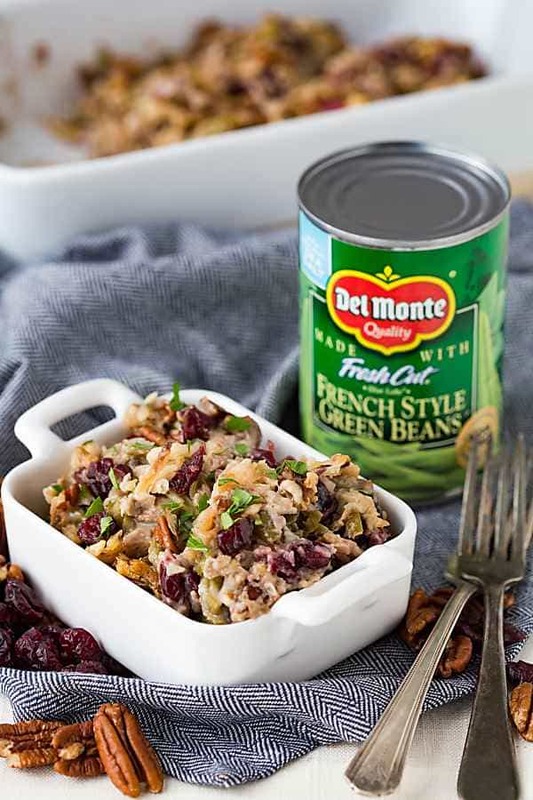 The pecans add some crunch, the cranberries a pop of additional flavor, and when combined with Del Monte canned beans, which are high quality and delicious, you get a tasty, easy, prep ahead dish that everyone at the table will rave about. Here’s the thing, I love my food to taste good, but I don’t want to spend hours slaving over it. When I’m hosting a holiday meal, the last thing I want is to feel stressed out, and be stuck at the stove while everyone else is enjoying each other’s company and watching football. I want to enjoy having everyone over, and actually get to spend time with them. I look for recipes I can prep ahead, and have made and in the fridge, so I can just pop them in the oven the day of. No mess, no stress. This green bean casserole is perfect for that. It comes together in under 50 minutes, but can actually be prepped up to a few days ahead of time then just cooked day of. You can literally just pull it out of the fridge and pop it in the oven. So easy, so tasty, and one of my favorite easy casserole recipes! With any recipe, to get the best flavors requires starting with great, quality ingredients. The key to a good green bean casserole is a good green bean. I use Del Monte canned vegetables, because they’re Garden Quality® vegetables. Because they’re picked at the peak of freshness, and they use little to no additives, they taste great, and are perfect for my green bean casserole. Did you know that the very day they are picked, Del Monte® green beans are canned with a dash of sea salt and water? That’s it! I love that. It doesn’t surprise me at all that Del Monte® has been the trusted vegetable brand for families since 1886, they take holiday traditions seriously, and provide products that support that. That’s why millions of families enjoy the trusted Del Monte Green Beans, grown in the USA. I know my family loves them, all year round, not just at the holidays. This year, Del Monte Green Beans will be gracing our holiday table, as we loved this fun twist on the classic, and I’m sure you will too. Do you have a great green bean casserole recipe you love? 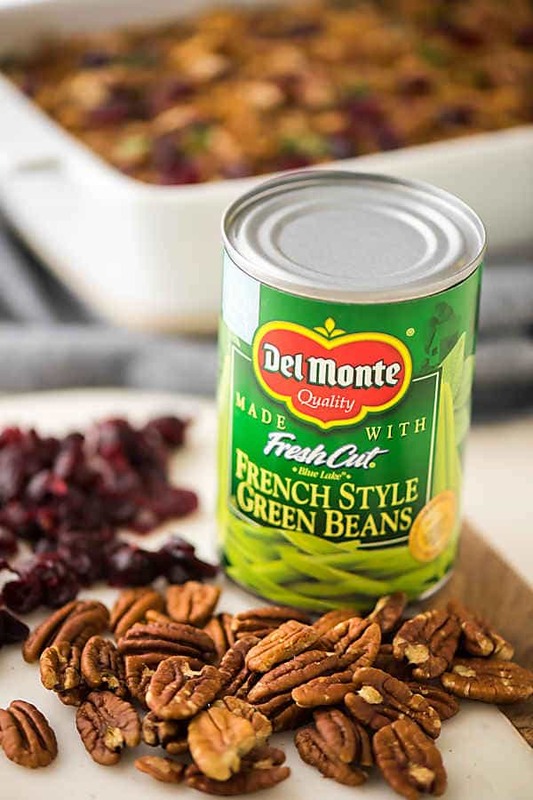 Del Monte® is launching a nationwide call for America to vote on their favorite holiday classic, the Green Bean Casserole. Visit the “Pick A Side” Sweepstakes on Facebook for your chance to win the #CasseroleCravings kit and $1,000 cash! I’d love to see someone from the Real Housemoms crowd win!! 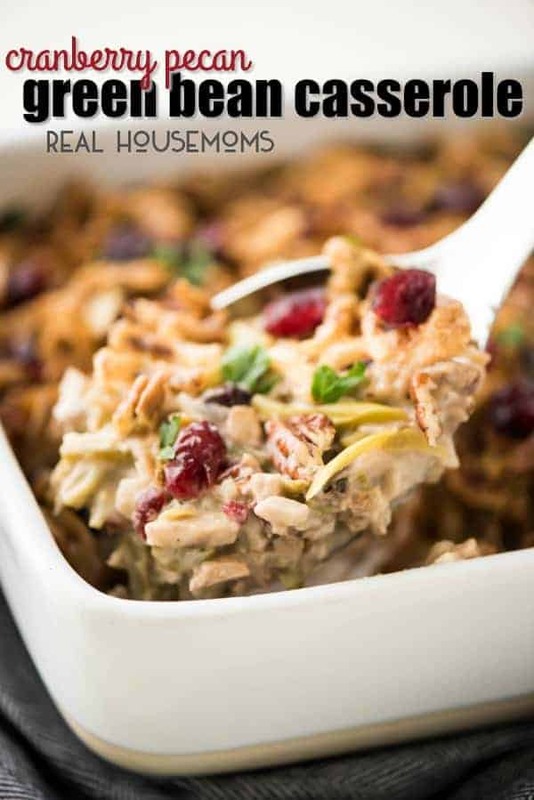 Click on over and vote for your favorite Twist on the green bean casserole but you know I’d love a vote for my Cranberry Pecan Green Bean Casserole it’s one of the five choice you have for voting!! 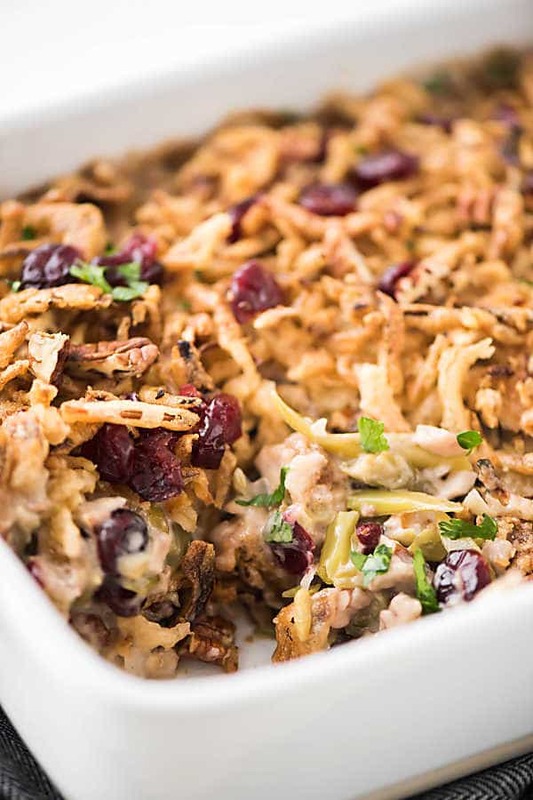 Cranberry Pecan Green Bean Casserole is an easy holiday recipe. It's a fun twist on classic green bean casserole and comes together in no time! Does this really feed 30 People?? Ooops. Probably more like 8-10 people, but 30 could happen if you double/tripled the recipe!